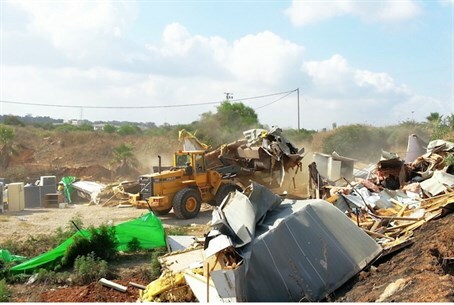 Police and city officials in the central Israeli city of Ramat Hasharon on Monday succeeded in removing an illegal Bedouin encampment, and evicting the Bedouin Arabs who for years have occupied some 70 dunams of prime land in the city. The land, next to the Cinema City movie theater complex, is said to be worth tens of millions of dollars. The land is owned by the city, and is located right off the main coastal road between Haifa and Tel Aviv. The Bedouin who occupied it illegally have been using it not only for living quarters, but for business purposes as well – opening up a wedding hall, a sports facility, a paintball amusement center, and other businesses. No taxes have ever been collected from these businesses. The land has long been slated for development by the city, but making deals with potential buyers has been impossible, because buyers preferred not to confront the “tenants.” The city has gone to court numerous times to force the Bedouin to leave, and in a recent court decision, received permission to use force to remove the illegal settlement and businesses. Large numbers of police and city enforcement officers descended on the site early Monday. Using bulldozers, it took several hours for officers to remove the buildings.